This is an important book for students studying civics or political science, equally important for those interested in the Indian state. 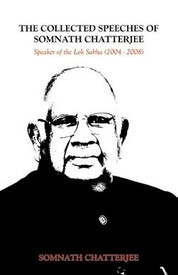 Somnath Chatterjee bestrode the Lok Sabha like a colossus of conscience – that same conscience that led to his being evicted from the Communist Party of India which he had served faithfully for four decades. As the Speaker of the House enforcing discipline, he expelled 10 members who were involved in a ‘cash for votes’ scam issue which caused more controversy. During his time in the Lok Sabha he was known for the speeches that he made orations which highlighted his sterling qualities and focused on the reforms that were needed and the administrative duties that should be performed for the efficient functioning of the Indian democracy.